Camping is a fun activity that many of us enjoy with our families growing up and as we get older our drive to build more memories can take us into the heart of the outdoor terrain. Backpacking is great way to step back from the everyday life and experience all the nature has to offer. When choosing a backpacking tent, it is important to know the key components and how they differ from your weekend family camping tent. Capacity: Number of people likely to use. Backpacking tents range in from 1-4 person capacity and the capacity is usually included in the tent name. (Ex. Big Agnes Copper Spur HV UL2) To keep weight down tents tend to be a snug fit and if you are bigger than average, or just like your space, I would recommend going up at least one designated size. Backpacking tents have advanced a ton over the years with new materials and constructions. When buying your new tent this is a great opportunity to greatly lighten the load of your pack without sacrificing comfort or features. Minimum Trail Weight: This consists of only the weight of the tent body, rainfly, andpoles. It does not include such things as tent stakes and a footprint. Packaged Weight: This is the weight of the tent when you buy it. This consists of thetent, rainfly, poles, stakes, stuff sack, pole bag, etc. Packed Size: This relates to the amount of space the tent takes up in your pack. Youcan reduce the size by splitting the parts up between you and your partner. The most popular choice of tent, a 3 season tent like the Big Agnes Copper Spur UL2 Classic is designed for very mild spring, summer, and fall weather. Pitched properly they can withstand heavy rain, wind, and light snow but, are not the best for sustained harsh conditions. The name says it all, they withstand everything a 3 season tent can and then some. For more moderate snow to harsher winds they can handle it. A 3+ season tent like the MSR Hubba Hubba NX 2- Person Backpacking Tent is great for someone who frequently takes trips to exposed, high elevation areas. 4 season tents like the The North Face Mountain 25 Tent are designed to withstand the harshest of conditions and heavy snow loads. These tents have much less ventilation and can feel stuffy in moderate temperatures. Heavier duty poles and fabrics. More poles and dome shape to withstand weather. When dealing with the living space of backpacking tents, keep in mind that comfort is based off of tent capacity, layout and weight. You will also want to strategically plan out any additional items you plan to bring because you will have to carry and fit everything into your pack. Hiking with a friend or group can be an added bonus since you can allocate each person to carry specific items like sleeping bags or cookware, making each person’s pack more desirable for them to carry. Finding the right balance between weight and size can be tricky but is key when organizing your pack essentials. When I am buying a backpacking tent I always consider the tent weight and livability of the tent and then base the price I want to spend off of the features I want to get. Weight and price go hand in hand with backpacking tents. Generally the more you spend the lighter the tent and vice versa. 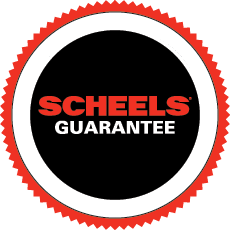 If you have any additional questions, stop in to your local SCHEELS store and visit with one of our camping experts.